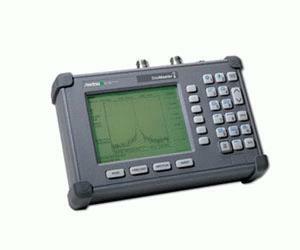 The Anritsu S114C spectrum analyzer is a wide band, very sensitive receiver. It works on the principle of "super-heterodyne receiver" to convert higher frequencies (normally ranging up to several 10s of GHz) to measurable quantities. The received frequency spectrum is slowly swept through a range of pre-selected frequencies, converting the selected frequency to a measurable DC level (usually logarithmic scale), and displaying the same on the CRT of the Anritsu S114C. The CRT displays received signal strength (y-axis) against frequency ( x-axis). Covering the 2 MHz to 1.6 GHz frequency band, the Site Master S113C/S114C site management tools are designed to accurately locate and identify RF cable feed-line and antenna system faults. These models are ideally suited for any experience user in commissioning and maintenance of today'''''s wireless communication system infrastructure including VHF, cellular and GPS applications.